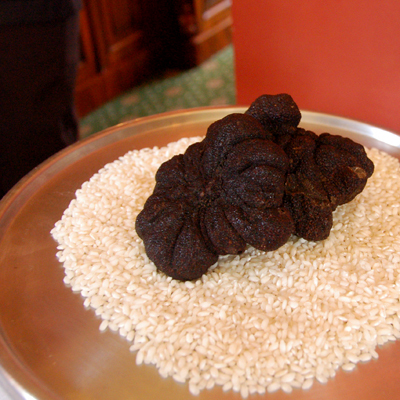 With Australian truffles in season, Yarra Valley’s Chateau Yering’s Executive Chef, Mathew Macartney, and Interlude’s Executive Chef, Robin Wickins, are preparing a Truffle Degustation Lunch at the Chateau Yering Historic House Hotel. Join Mathew and Robin for an exclusive six course unforgettable truffle taste sensation, each course matched with the prestigious Domaine Chandon Wines, on Sunday 3 August. We found out about this event at Interlude and it provided us with a great excuse to return to Chateau Yering and to enjoy more of this seasons truffles. 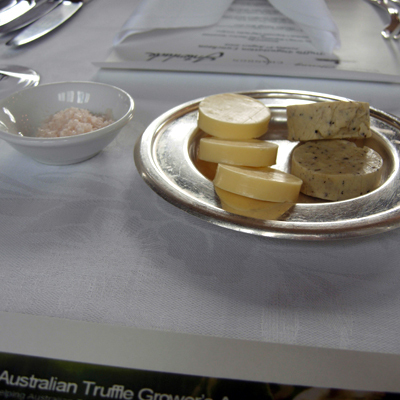 All the truffles for this meal have been sourced from Tasmania. 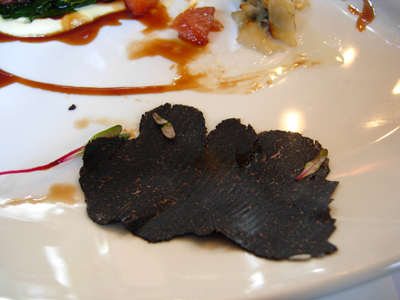 The meal began with a brief talk by a representative of the Truffle Growers Association. This year the Australian industry will produce 2 tonnes of truffles - half from WA, a quarter from Tasmania, with the remainder coming mostly from NSW. 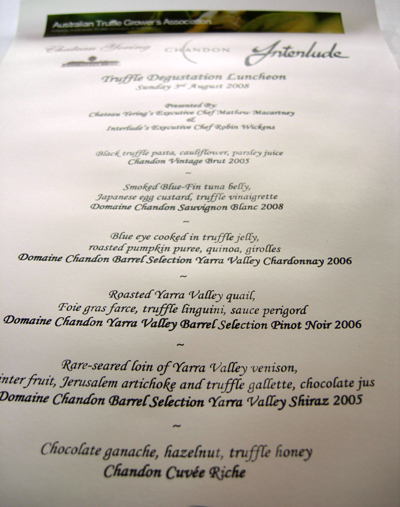 Victoria is only a small player at the moment with truffles coming from the Yarra Valley, Gippsland and the Otways. This year Victoria expects a yield of 5-6 kilograms. 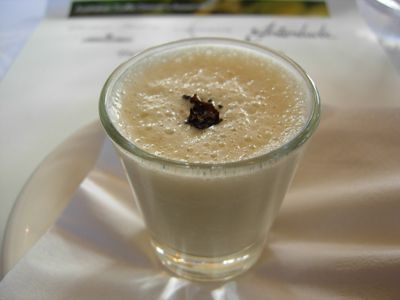 Jerusalem artichoke veloute topped with shaved truffle - a warm, creamy, earthy, light and fluffy mix - a perfect combination to begin the meal. This was a dish by Robin. 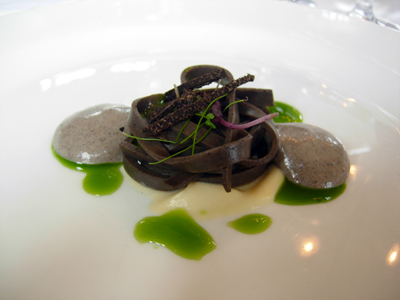 The black truffle pasta was actually a black truffle jelly formed from a black truffle puree and cut to resemble pasta - it was served on cauliflower puree, topped with julienne truffle. 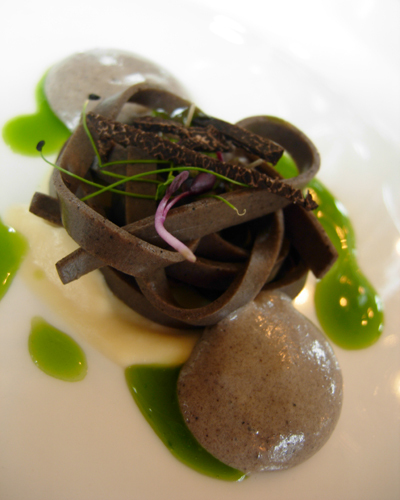 To the sides are orbs of warm truffle foam accompanied by dots of parsley oil. This was a dish by Mathew. The tuna belly was first cured and then smoked - very thinly sliced it is served on the base of the plate. It is topped with a cube of truffled Japanese egg custard onto which has been placed, tiny cubes of marinated tuna. 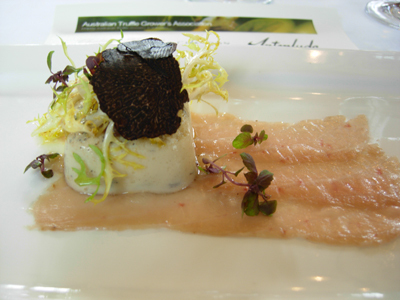 Above this is a frisée salad dressed with a truffle vinaigrette and topped with slices of fresh truffle. This was a dish by Robin. Using low temperature, the blue eye is poached inside truffle jelly. 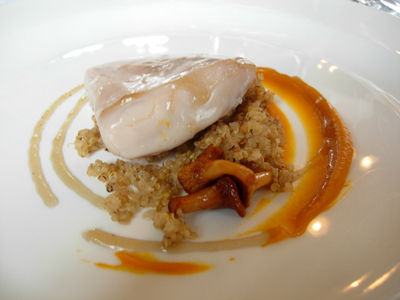 It is served simply with a puree of roasted pumpkin, quinoa and seared girolles. It was sad to see people scraping off the jelly to eat the fish! A strip of beetroot paste runs the width of the plate. 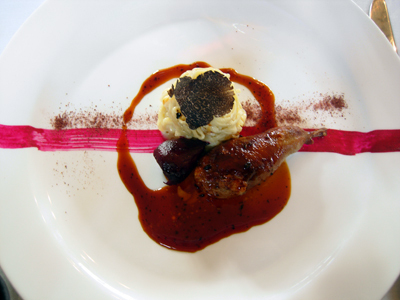 The quail was partially boned and stuffed with a maple syrup marinated foie gras and truffle farce, served alongside are fresh linguini in a truffle sauce, roasted beetroot and sauce perigord. A sprinkling of beetroot dust finishes the dish. 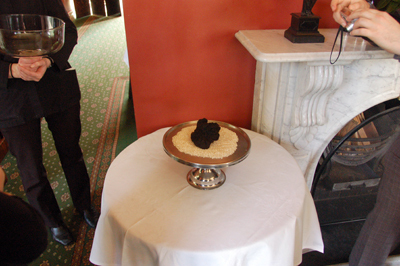 This is what 500 grams of truffle looks like. This is also a dish by Mathew. 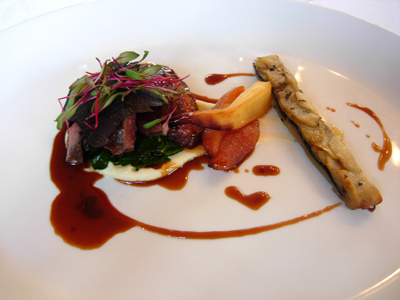 The venison rests upon a celeriac puree and sautéed black cabbage. To the side roasted winter fruits and a thin slice of Jerusalem artichoke and truffle gallete. 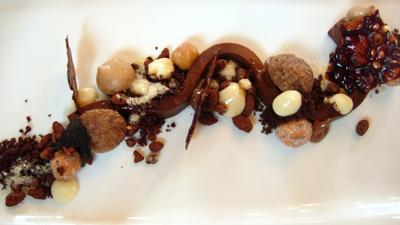 A chocolate jus is drizzled over the plate. 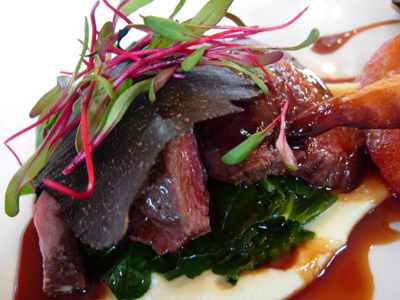 The venison is topped with truffle slices. In my case, a very large slice of truffle! We end with a dish from Robin. A ribbon of chocolate ganache is decorated with roasted hazelnuts, balsamic vinegar meringues, chocolate toffee, slivers of truffle, chocolate puffed rice, dots of white chocolate and a drizzle of truffled honey. 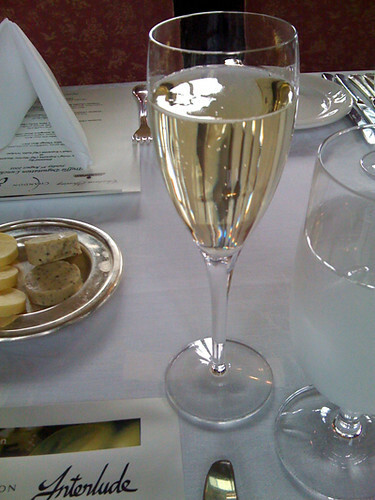 A seriously stunning way to end a remarkable meal. 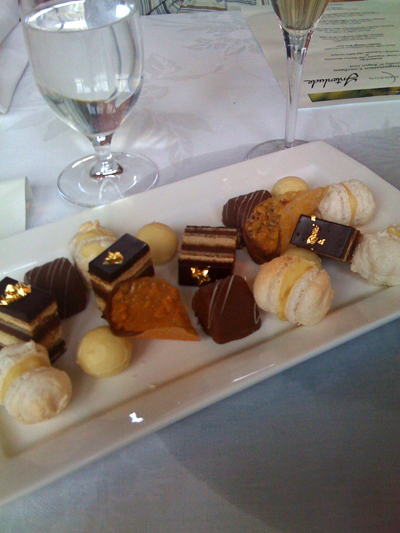 With coffee to finish, plates of petit fours. 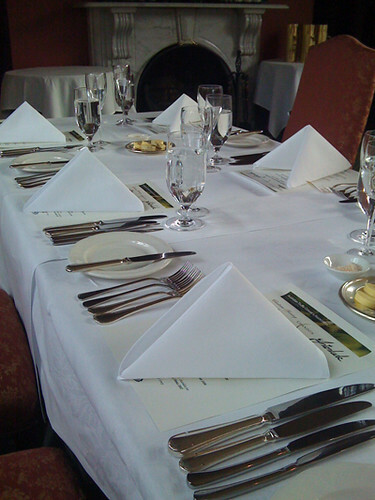 The dishes were very stunning! Which was your favourite? Very difficult question - I've even had to consult with Paalo and we can honestly say that we can't pick a favourite - they were just all so perfect in their own right.